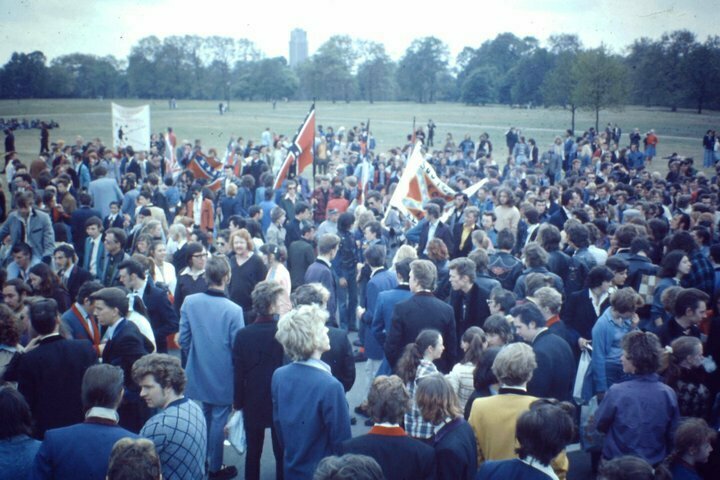 One major event happened in the 1970's which brought Teddy Boys to the fore nationally, was the 'March to the BBC' and this took place on Saturday 15th May 1976. 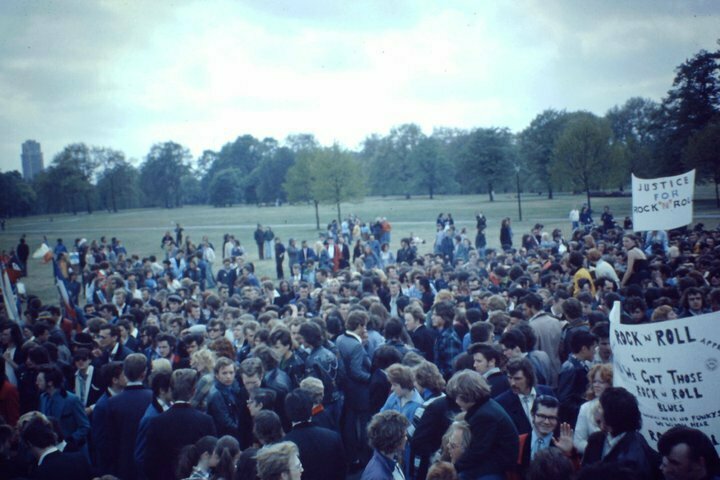 This involved thousands of Teddy Boys and Girls from all over the Country marching through Central London to the BBC studios in a national campaign for more Rock 'n' Roll to be played on the Radio It was particularly at the lack of authentic Rock 'n' Roll being played on the Radio that was also at the root of the protest. However, the events leading up to this March and subsequent epic concert recording at Picketts Lock began in the dark winter days of 1975. This started as an idea to gather Rock 'n' Roll fans from all over the country to join forces and march through the streets of London to BBC Broadcasting House, to demand more time on Radio for our kind of music: Original Rock 'n' Roll, seemed impossible, but after months of publicity, promotion, touring around and foot-slogging spreading the word, the great day arrived and there outside Hyde Park, London. was the amazing sight of thousands of people (over 5000) nearly all Teddy Boys and Girls, all resplendent in their best gear, ready to march, and march they did! 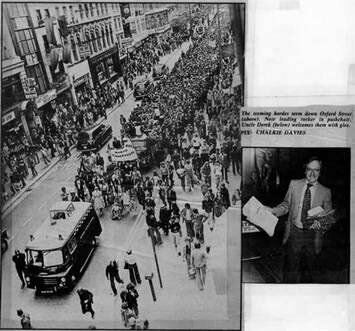 The march culminated at the BBC Broadcasting House in Wood Lane, White City, London W12 where a 50.000 strong petition and a taped pilot Rock 'n' Roll show were handed in. The Teds that marched were a mixture of original 'Edwardians' and younger followers of 1950s rock. They wore their hair in greased quiffs, and dressed in 'drape' jackets, drainpipe trousers, brothel creepers and winkle-pickers. The girls wore blouses and flared skirts. Together they represented a thriving underground scene based in pubs and clubs the length and breadth of the country. The campaign was a total success and the BBC caved in and this resulted in Harrogate born Stuart Coleman who had helped organise the march and much to his suprise into delivering a weekly Rock n Roll Show on Radio 1 late on Saturday afternoons. After the march, the day was far from over for all those fans who had made the journey to London. The climax of this unique day was the live Rock 'n' Roll show at Picketts Lock. For this major event, three of the top Rock 'n' Roll bands in the country were to play: Crazy Cavan 'n' the Rhythm Rockers, The Hellraisers and Flying Saucers. An LP of the Picketts Lock Show was made entitled 'Rock'n' Roll is still Alive'. More than five thousand turned up, and their message came over loud and clear: in the words of Danny and the Juniors - Rock and Roll is here to Stay!